With Beehively, all of your student information, grades, attendance, and communication is in one place. Connect parents, teachers, and students. 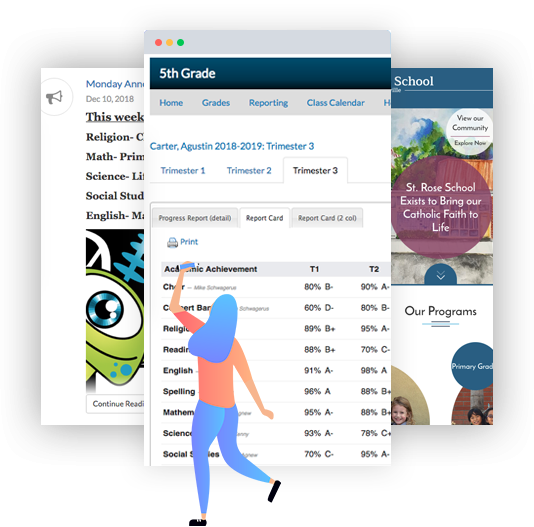 Easily share important information, grades, and updates. Online grades that sync with Google Classroom are easily shared with students and parents. The website your school deserves with the support you need. Unlimited content changes, training, and support from our team of experts. Link your existing infrastructure and add functionality. Login with Google, share files with Team Drive and send reports from Google Classroom. "Beehively has been serving me and my school for the past six years. The responsive & professional staff has made my job as Principal so much easier. Their service and advice are unmatched!" "You guys have been great getting things up in record time. I really appreciate it." "As always, I know you will answer my questions quickly and clearly! I appreciate that more than you know." "I am so thankful for your help, assistance, and patience with our new website! It looks great and the process for me was quite painless. I am very appreciative of your kindness and positive attitude throughout. Thank you for working so hard on it!" "The entire Beehively staff has always been responsive and willing to go above and beyond to ensure that St. Philomene has the resources needed to be successful. I appreciate and thank you for all that you do for our school." "Thank you so much for your help today and for your fabulous team! They are professional, timely, and go out of their way to assist." "Thank you so much for all your help these past few years in helping meet my needs for our beautiful Saint Hilary website. You all have done a great job in fields my thousands of requests, and I'm grateful. I think in the last two weeks alone I've sent you hundreds of requests for updates. Thank you." "Thank you for the time you spent with me to make this an amazing redesign. Your dedication to my project was truly unwavering."